The Induction Box is made from 10mm thick acrylic with an inlet hose connector at the bottom level and at the opposite side with an outlet ø23mm (at the lid level). The lid can be opened by vertical sliding the lid off of the induction chamber. When the induction box is connected to the UNO Gas Exhaust Unit and the lid is closed, there is a relatively high internal resistance to the ventilation of the Exhaust Unit. Therefore the Gas Exhaust Unit only takes very little of the anaesthetic gas mixture from the induction box and as a result, the animal is optimally exposed to the anaesthetic gas mixture. As soon as the animal is anaesthetised, the lid of the Induction Box can slide open. By sliding the lid open, the internal resistance from the exhaust ventilator is reduced and the UNO Gas Exhaust Unit is immediately exhausting at maximum capacity, thus preventing the anaesthetic gas mixture from escaping from the induction chamber into the room/working area. 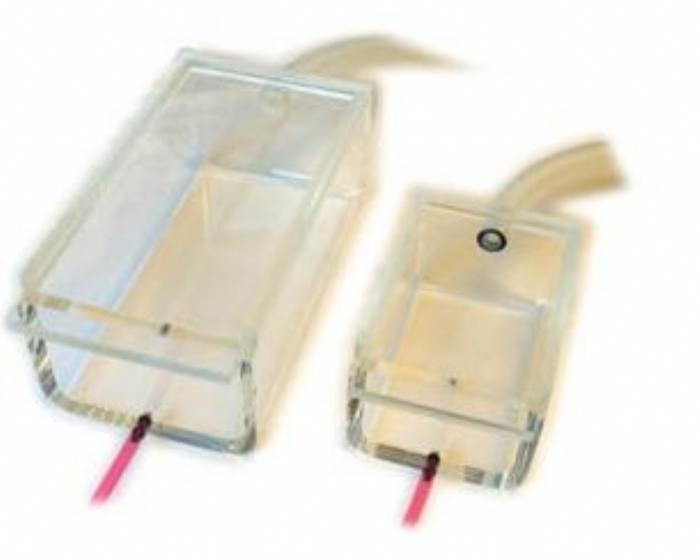 The induction Box is thus rapidly emptied from the anaesthetic gas mixture and the lid can be taken off to get the anaesthetised animal (mouse or rat) out.